UDM Downloads > Power Mixer! 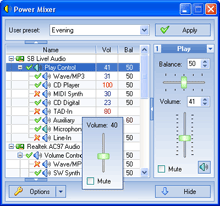 Power Mixer is an advanced Windows audio mixer, a complete replacement for the standard Volume Control. This application lets you easily change the sound volume by simply rotating the mouse wheel or by using keyboard hot keys. It includes an audio mixer with advanced volume controls support, a scheduler, an on-screen display, command line support, the ability to store and recall different unlimited presets via one mouse click or system-wide hot keys. By using presets you can change all parameters of sound simultaneously! It is designed to be especially useful for those who play games, work professionally with sound, or are everyday users.